We all enjoy the convenience, fun, and safety of flying. We also understand that there may be times when our best efforts for a safe flight will be inadequate, and an accident could happen. While most accidents are minor and pose no significant risk to the airplane or its occupants, some can result in major injuries or fatalities. However, studies of serious accidents have shown that the proper use of shoulder harnesses, in addition to the safety belt, would reduce major injuries by 88% and reduce fatalities by 20%. Shoulder harnesses have been required for all seats in small airplanes manufactured since December 12, 1986. If your airplane is not equipped with them, you should obtain kits for installing shoulder harnesses from the manufacturer or the manufacturer's local sales rep. Given the percentages above, the expense of retrofitting appears to be well worth it. FAA regulations require that safety belts and shoulder harnesses (when installed) be properly worn during takeoffs and landings. If the restraint is not worn properly, it cannot provide full benefits and can even cause injury in a serious impact. Tests have shown that slack in the restraint system should be minimal. In an impact, your body keeps moving until the slack is taken out of the restraint, but then your body is abruptly stopped to "catch up" with the airplane. he restraint should be adjusted as tightly as your comfort will permit to minimize potential injuries. The safety belt should be placed low on your hip bones so that the belt loads will be taken by the strong skeleton of your body. TIf the safety belt is improperly positioned on your abdomen, it can cause internal injuries. If the safety belt is positioned on your thighs, rather than the hip bones, it cannot effectively limit your body's forward motion. Shoulder harness systems can use dual shoulder belts or a single diagonal belt similar to those used in automobiles. The belts should not rub against your head or neck. This is uncomfortable and will discourage use of the shoulder harness and can also cause neck injuries during an impact. Single diagonal shoulder belts should be positioned so that the torso's center of gravity falls within the angle formed by the shoulder belt and the safety belt. belts will tend to pull the safety belt up off your hip bones. This could cause internal injuries in an impact. When it is tightened about your hips, the safety belt should be positioned so that it makes an angle of about 55¼ with the centerline of the airplane . This allows it to resist the upward pull of the shoulder belts, reducing the risk of internal injury. 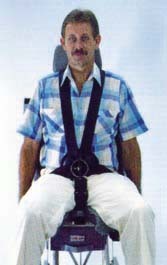 Otherwise, a tiedown strap from the buckle to the center-forward edge of the seat may be necessary to resist the upward pull of the shoulder belts. If your restraint system uses a tie-down strap, adjust it to remove all the slack when the restraint system is used. A properly installed and adjusted tie-down strap is completely safe. the child seat cannot interfere with the airplane controls or limit pilot access to the radios or flight instruments. Install the child safety seat according to the instructions provided with the seat, using the airplane safety belt to secure it. Most safety seats for small infants are intended to place the infant in a rear-facing position and should be installed that way in the airplane. Remember to consider the weight of the child and the seat when calculating the weight and balance! When children outgrow the safety seat, they can safely get by using only the airplane seat belt. Their small size limits the chance that they might make contact the airplane interior during an impact. Larger children can use the shoulder harness if it doesn't rub on their face or neck when they are seated. Seat belts alone will protect you only in minor impacts. Using shoulder belts in small aircraft would reduce major injuries by 88%, and fatalities by 20%. Shoulder belt kits are now available for most airplanes. Automobile child seats provide good protection for small children in aircraft. If improperly installed and used, restraints could cause injury. Restraint systems in small aircraft: A Smart Idea! FAR§ 91.105(a)(1)and(2) says that- During takeoff and landing and while en route, each required crewmember shall be at his or her crewmember station-unless the absence is in performance of their duties or for physiological needs-and shall keep the safety belt fastened while at the crewmember station. Each required flight crewmember shall during takeoff and landing keep his or her shoulder harness fastened, if one is installed, while at the crewmember station. This regulation does not have to be complied with if no shoulder harness is installed or if the crewmember would be unable to perform required duties with the shoulder harness fastened. No pilot may take off a U.S.-registered aircraft (except a free balloon or an airship type certificated before November 2, 1987) unless the pilot in command ensures that each person on board is briefed on how to fasten and unfasten his or her safety belt and shoulder harness, if installed. No pilot may take off, land, or operate an aircraft on the surface (same exceptions as above) unless the pilot in command ensures that each person on board has been notified to fasten his or her safety belt and shoulder harness, if installed. Proper use and adjustment of seat belts and shoulder harnesses are essential to an air show performer's ability to complete high-performance, precision-flight maneuvers. What some don't realize is that proper use and adjustment of the restraint system on the ground can save your life as well. We have two fatal examples that seem to prove this. Last year the pilot of a T6-G died when his aircraft nosed over on its back while on soft ground. The aircraft sank about 12 inches, and most of the inverted pilot's body weight was on his shoulders. His head was flexed forward, and his legs came up toward his head. In other words, he was hanging upside down with all his weight concentrated on his shoulders on the front of his body. Traumatic asphyxia occurred and the pilot died. Excessive slack in his seat belt adjustment caused the unusual position, and with all his weight on the buckle, the pilot was unable to release the lap belt and shoulder harness. A similar situation appears to have been involved in the death of Charlie Hillard last April at Sun Ôn Fun. His aircraft nosed over also after an uneventful landing, and Hillard was suspended upside down in a similar position. His cause of death was tentatively indicated as asphyxiation. First, bring lap belts up tight with the buckle centered over the lower abdomen. Tighten the crotch strap and then tighten the shoulder harnesses. A ratchet adjustment, available on some lap belts, allows quick re-tightening in flight. Most aircraft used in air shows and competition have crotch straps, but few warbirds have been modified. It's probably not necessary for mild positive G maneuvers but could save your life in the event of a roll-over accident.